Every beer geek can probably remember back to the first craft beer they had that opened their eyes to the vast array of flavors that can be present in a beer. For me, that beer was Chimay Grande Reserve. Unlike anything I had ever had before, it drove my curiosity to explore other Belgian styles and before I knew it, Tripels became my new favorite. To this day, I still love how the spiciness from the yeast and alcohol plays well on top of the soft malt character while the high carbonation helps to aid in a dry, slightly bitter finish. As a homebrewer, brewing a Tripel isn’t the most exciting beer in the world to make. Granted that it can be difficult to achieve the dryness and the right characteristics from the yeast without producing an overly hot beer, a grain bill comprised of mainly pilsner malt and cane sugar just doesn’t hold the same appeal that maybe a barleywine does. To up the ante a little bit, I wanted to add another layer of complexity by incorporating the flavors that a beer often receives during extended aging in a bourbon barrel. Before getting too excited about the simulated bourbon barrel aging, I wanted to make sure that the base beer wasn’t neglected and that it still retained the properties of a high quality Tripel. To me, a lack of dryness and excessive alcohol heat are two of the most common flaws in this homebrewed style and so to combat this, I wanted to make sure that the base beer had plenty of easily fermentable sugars and that the fermentation temps were restrained. 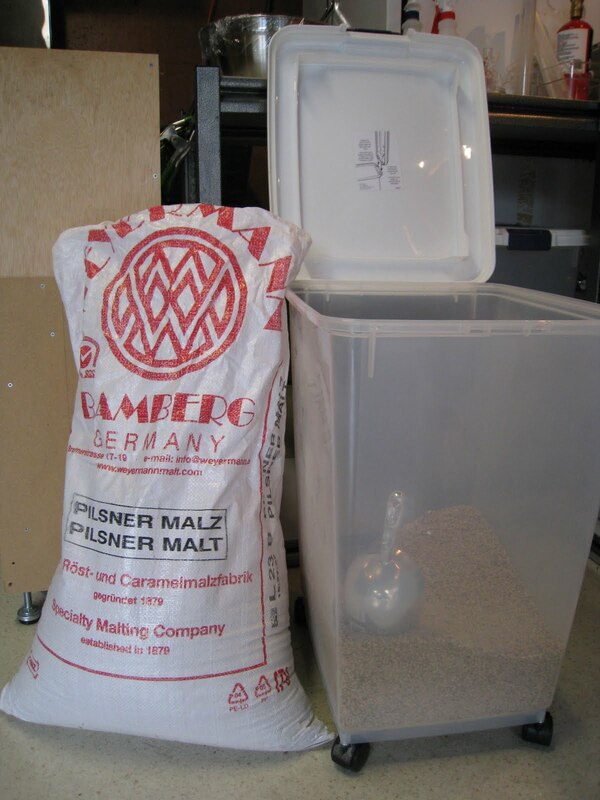 The grist of primarily German pilsner malt was mashed long and low at a temp of 147° and then to the boil, nearly 18% of the total fermentables were added in the form of cane and candi sugar (it would have been fine with 100% cane sugar, but since I had a 1lb bag of clear candi syrup on hand, I decided to throw it in). As for the fermentation, I pitched a 1500ml starter of Wyeast’s Trappist High Gravity yeast to the wort at 64°. Even though this strain of yeast can handle much higher temps, I decided to keep it low initially to restrain the heat and excessive phenolics. After a period of 36 hours, the temp was raised 1° per 24 hours until a max temp of 72° was reached to finish out the beer. After primary fermentation, I started the simulated bourbon barrel aging process. The beer was racked into a keg which contained 1 oak stave that had been soaking in Makers Mark for about 2 weeks. I knew that this would not be quite enough oak or bourbon to impart the desired flavors, but I wanted to take it slow. Part of my problem with other Bourbon Aged Tripels is that the bourbon is too forward and the subtleties of the base beer are lost. I wanted this beer to be a quality Tripel first, with just a hint of bourbon and oak on the finish. After three months, you really couldn’t perceive any bourbon or oak character, so I added two more oak staves and an 8th of a cup of bourbon. With another two weeks passing, the bourbon still wasn’t quite where I was aiming. After letting the beer rest for one more week, I pulled out a glass and using a 1ml dosing syringe, I continued to add more bourbon until the appropriate balance was reached. Scaling this amount up for the volume that I had in the keg, I ended up adding another 12mls. Mash Additions: 1 gram/gallon Calcium Chloride, ¼ gram/gallon Epsom Salt, 0.085 gram/gallon Baking Soda, and 0.2 gram/gallon Salt. 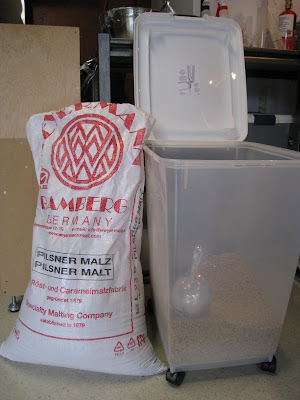 10/28/2010 – made starter with 1 liter of 1.35 wort. 10/29/101 – added 500ml of wort to starter. Hit dough-in temp of 147 exactly and rested for 60 minutes. Whirlflock and yeast nutrient added with 15 minutes to go in the boil. Chilled down to 64°. Ended with 6 gallons of 1.070 wort. Aerated for 60 seconds with pure 02 and pitched yeast starter. After 36 hours, temp was raised 1 degree per day until 72° was reached. 12/11/2010 – Transferred to secondary. Added 1 oak stave (1 inch by 1 ½ inch by ¼ inch) that had been boiled for 10 minutes and then soaked in Makers Mark for 12 days. Secondary was moved down to the basement which was about 63°. Gravity down to 1.005. 3/6/2011 – Bourbon and oak are extremely subtle…almost non-existent. Added two more oak staves (both had been boiled) and about 1/8 cup of Makers. Moved to fridge to lager. 3/11/2011 – Added 1 more oak stave. 3/29/2011 – Taste wasn’t exactly where I wanted it, but I started carbonating to 2.4 volumes anyway knowing I would add more bourbon later. 4/10/2011 – Using an 8oz sample, I gradually dosed bourbon until the right balance was reached. After scaling this up to the full batch, I ended up adding another 12mls to the keg.